Relaunching the watches line they created with Dieter Rams back in the '70s is possibly one of the greatest ideas Braun will ever have. 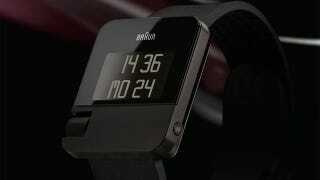 Designed by Zeon, they're actually very Apple; almost like tiny iMacs strapped to your wrist. Available in black and silver, both have just a single recessed button for lighting up the display, plus a scroll-wheel for switching functions (and presumably adjusting the digital time,) the watches should be released in the fall of this year.